I have grandkids who eat at my formal dining room table. I need to protect the wood table while maintaining my decor. 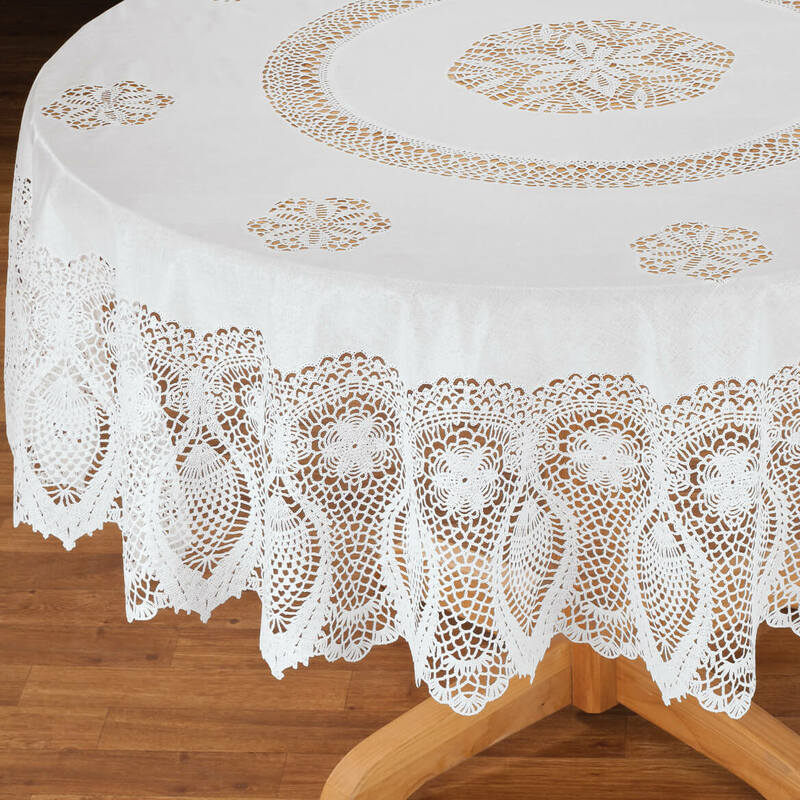 I wanted a table cloth that would enhance my grandmother's dining room table that was easy to clean. They are pretty and easy to care for. I throw them in the washer when needed. I use them outside on my patio. I have ordered and used this product before for social function both in church settings and personal settings. I appreciate the cleanability and look this adds over a cloth tablecloth for formal type settings, plus the economic value is within my budget. thought it would good for playing cards on but I now have my doubts as I didn't realize there was so much open lace work on the top surface. 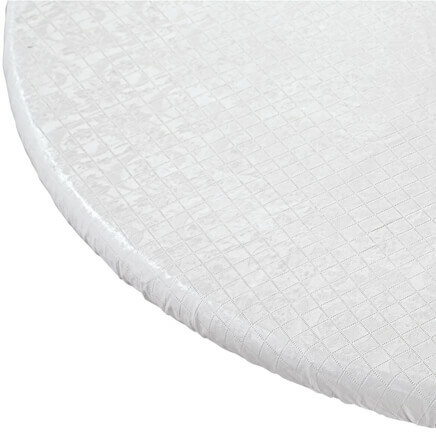 it was beautiful and looked great on the Holiday table, as well as protect my cloth covering. Bought one oblong. Design is very pretty and looks like the real one. Love it. i like an elegant look and my kitchen table gets a lot of use. Would like your catalogue to view more tablecloths. I just now ruined the one I had for 20 years. I bought one from you three years ago and after many uses it is tearing in spots. I love the ease and protection this gives while all are eating. It is so easy to clean if there is a spill. It’s beautiful and looks elegant on my table! These are beautiful tablecloths. We've ordered them before. They look like an expensive cloth lace on the tables. If you didn't know they are vinyl, you would have to fell them to see if they really are. 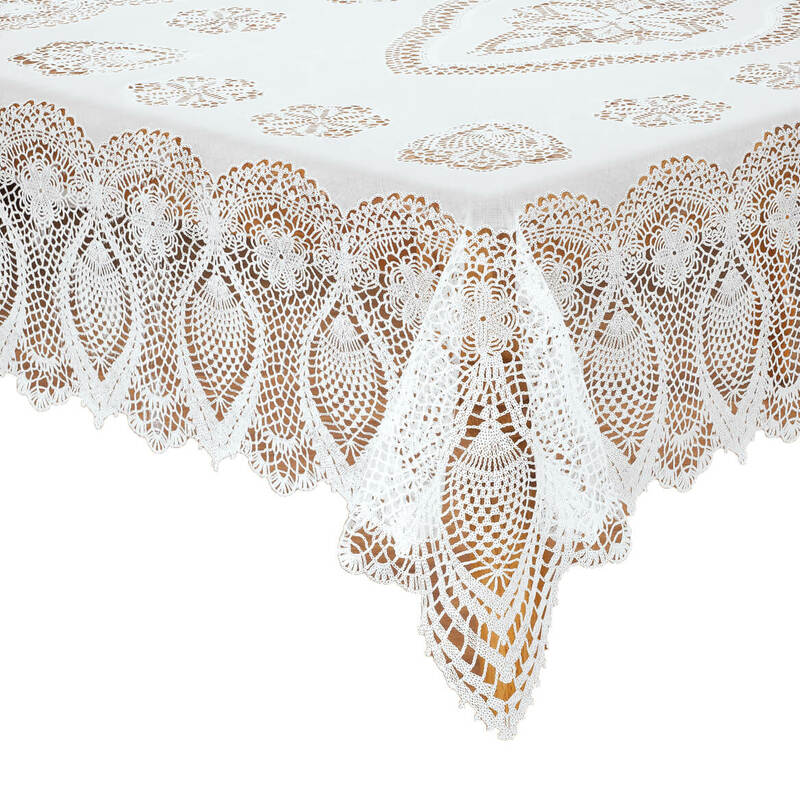 I truly loved the design on the this table cloth! Can not wait to put it on my new table!!! I looked up your website and looked good. It look like crochet . 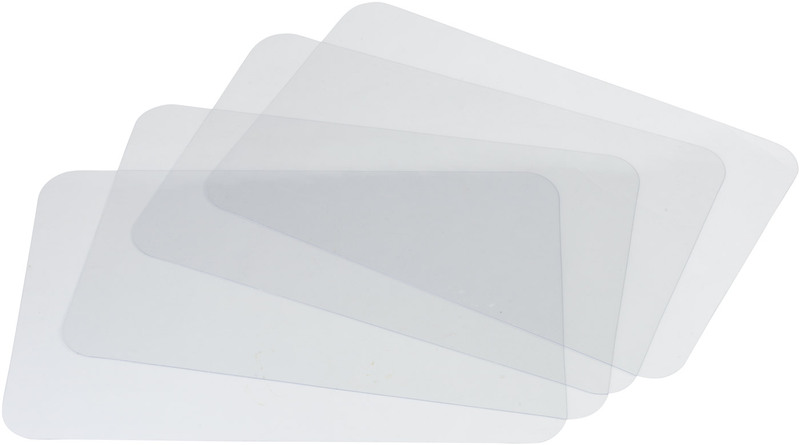 You offered me the largest selection of white lace vinyl tablecloths. It looks beautiful and I hope it works!!! I liked the pattern and I needed a table cloth for my round table. 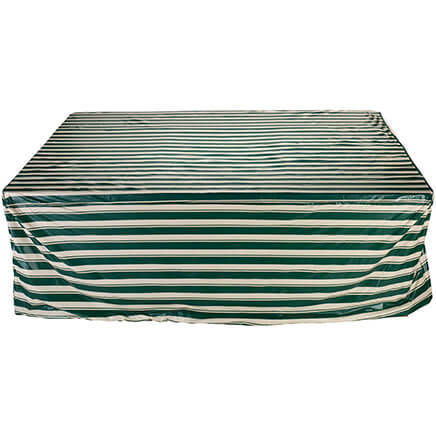 I had this particular vinyl table cover in a rectangle shape for years! It was nice in appearance, practical and durable. 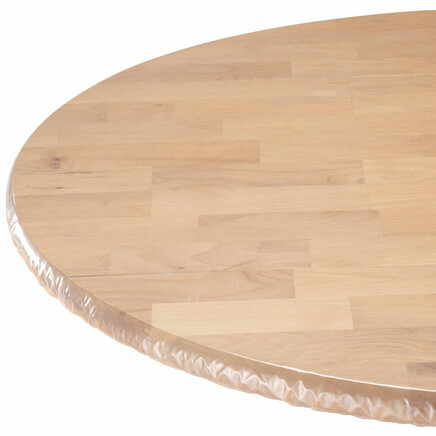 I now have three round tables and ordered it for all three! This is a replacement for one we have had mauy years. In fact when we got ready for this new one we thought the old one was an antique. 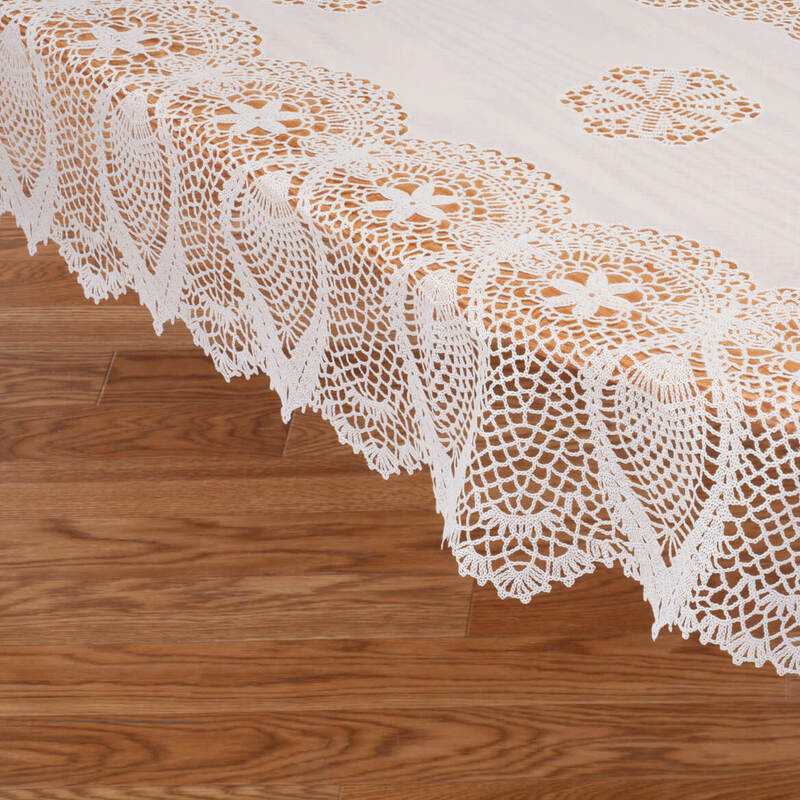 Is this solid plastic, or does it have holes like a real lace tablecloth? BEST ANSWER: Gladly.....this is a "feels real" soft plastic with real holes! I love it! I always keep one on hand just in case something happens to it on the table! 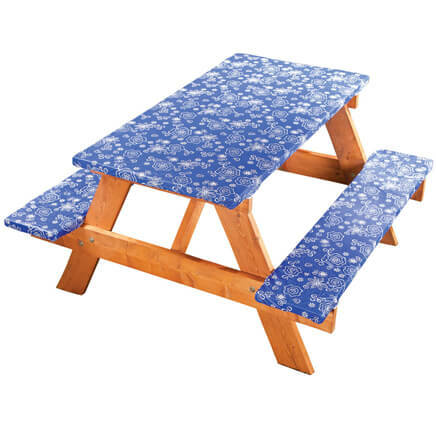 For so little a price, it is very durable and can be used as a tablecloth or with a colored cloth underneath. It looks like lace and feels like lace! I like the other one too, that is similar. Very nice table cloth for the cost! It has holes like real lace. Works great ar our church, colored plastic table covers go underneath & look pretty for the season. 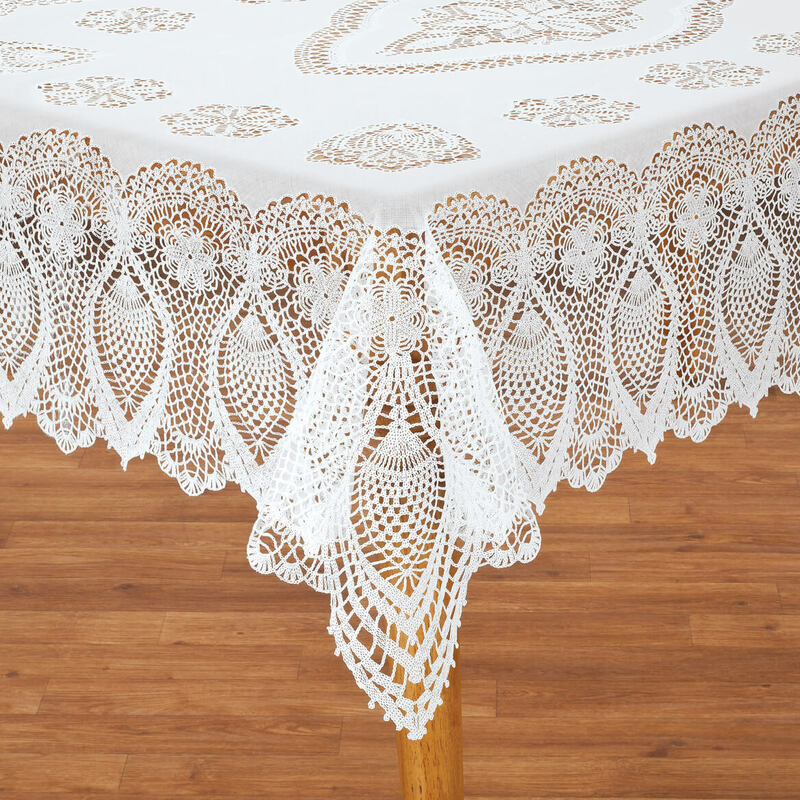 The tablecloth has holes like a real crocheted one. The holes are where the "pineapple crochet" is. table is 48 by 60 what size do i buy? BEST ANSWER: The gener rule of thumb is to add 12 inches to each measurement so you have a 6 inch overhang on each side. Therefore: 60 x 72. Hope this helps. 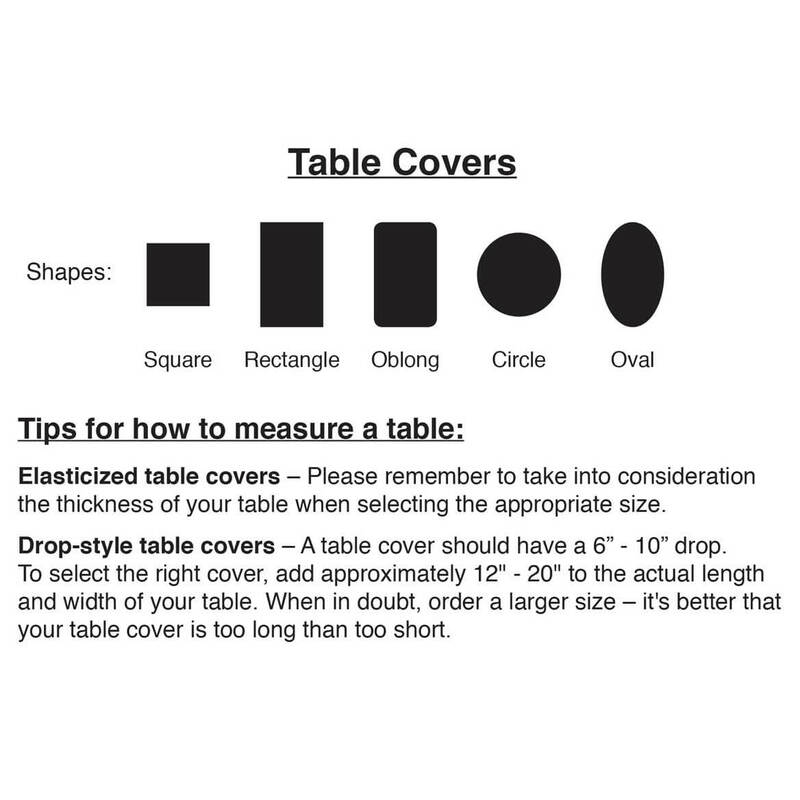 The tablecloths should be at least 12 inches greater than the table. can you please tell me how thick is this vinyl tablecloth? BEST ANSWER: Thank you for your question. It is about as thick as a piece of paper. We hope this information will be of help to you.